After creating your campaign, you might be curious about how it will appear to your recipients once it's received. SendinBlue makes it easy to send test emails and preview how your email will look on different devices. Our test email feature allows you to send a test (or multiple tests) to your desired test recipient(s). Once you're finished designing your campaign (but before moving on to choosing your recipients), click the Send a test button located above the campaign preview. You may send a test email to new individual recipients by inputting the desired address(es) and clicking the Send a test button. Don't worry -- if you enter an address that's not already in your contact list, SendinBlue will prompt you to automatically add it to your contacts before sending. 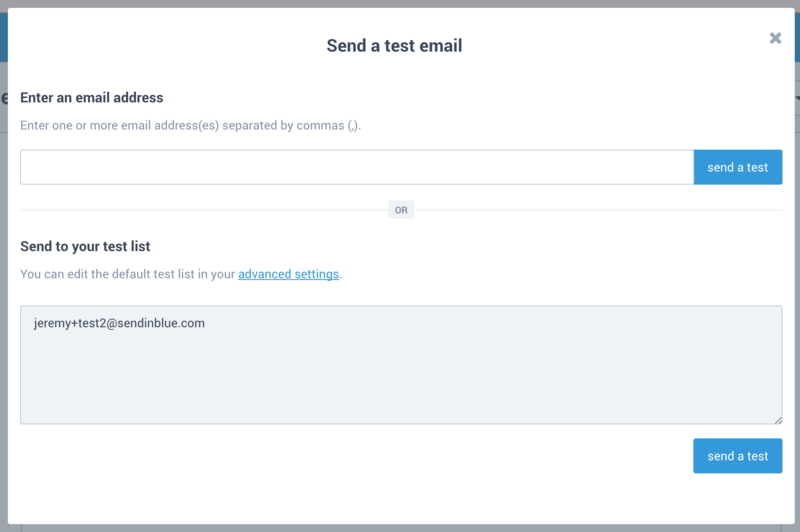 To send a test email to your SendinBlue account test list, simply click the Send a test button below this option. To review your campaign, click on the Preview button and select Preview on different email clients. This tool does exactly what you'd expect and allows you to preview how your email may appear on when viewed on various devices, screen sizes, and email providers. Some platforms & devices can't display HTML and require a plain text version of the email. There are also people who choose to block HTML emails and prefer only the plain text version, so it is better to send both. SendinBlue automatically generates a plain text version of your HTML emails to save you time. You can preview the plain text version of your HTML emails and choose to edit them. Any edits you make to the plain text version will only affect the plain text version and do not modify your HTML email. To view the plain text version, click on the Preview button and select View the plain text version. This will open a pop-up displaying your email as plain text. If you wish to edit the plain text email, click on the Edit button at the bottom of the pop-up.